Rendering of new Clay Development project that will be built in Cedar Port. 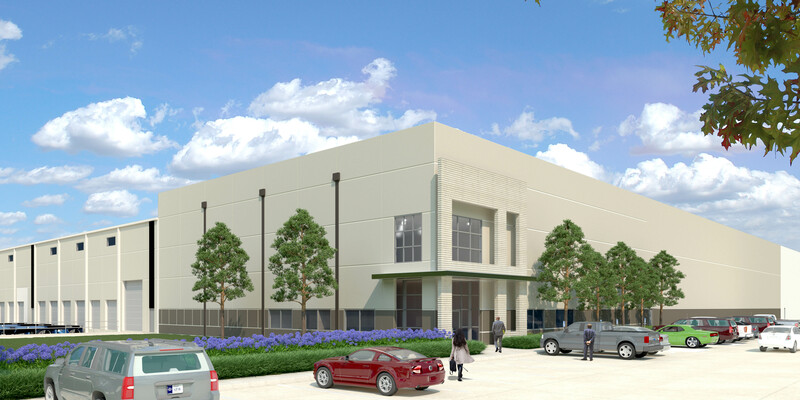 HOUSTON – (Realty News Report) – Clay Development & Construction Inc., a Houston firm led by Robert Clay, is developing a 349,440-SF, rail-served distribution building in the Cedar Port Business Park on the east side of Houston. The site is just east of FM 1405, not far from the Post of Houston and Interstate 10. Both Union Pacific and Burlington Northern Santa Fe provide rail service and the project has barge access. Clay, which has developed other property in Cedar Port, purchased the land for this latest development, called Cedar Port IV Distribution Center, in June. Leasing and sales of the new development will be handled by Clay’s Charlie Christ, and CBRE’s Billy Gold and Joseph Smith. Completion is scheduled for the summer of 2019. The site is immediately accessible to Highway 99/Grand Parkway at Fisher Road. The Port of Houston, Interstate 10 and Highway 146 are within minutes of the property. Cedar Port IV will feature 32-foot clear-height ceilings, 50-by 52-foot column spacings and 60-foot loading bays. The professionally managed, deed-restricted Cedar Port Business Park provides a regional water detention program and ESFR fire sprinkler system. Construction and architecture for Cedar Port IV are by the in-house team at Clay Development & Construction. Construction financing is by Frost Bank. Next: West Side Wisdom: Q&A with Vista’s Woody Mann Jr.